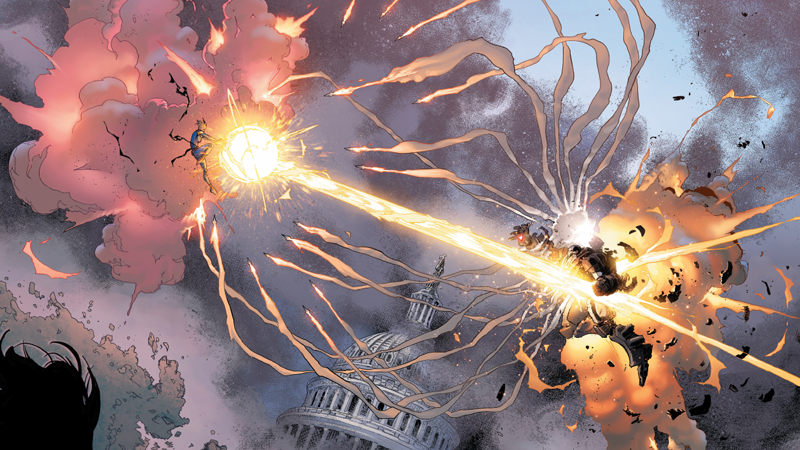 Marvel’s Civil War II killed off War Machine, the Hulk, and Iron Man (kind of). The big event certainly changed the landscape of the Marvel Universe (again, kind of), but no one seems to really care. Neither does Marvel for that matter, and that’s ultimately the problem of Civil War II. Civil War II was going to be big. It’s sequel to the massively popular, but ultimately misguided Civil War event series where Captain America and Iron Man went to war over the Superhero Registration Act — the story that formed the basis of 2016’s Captain America: Civil War which told the same story in miniature. The stakes were high for the sequel. Civil War II was meant to capitalize on this blockbuster, this time by pitting the company’s two hottest heroes, Captain Marvel and Iron Man against each other. The pair fought over the oddly prescient concept of predictive justice, an analogous metaphor for the surveillance state and profiling practices of modern justice systems. It was all very big, and started off with a bang: By killing James “Rhodie” Rhodes aka War Machine. Then the bodies kept piling up. Rhodes’s funeral was a platform to half-heartedly talk about race. Bruce Banner was killed by Hawkeye in a moment of, what could charitably be described as “assisted suicide”, which set the course for a seriously injured She-Hulk to become a raging monster — because apparently she and Bruce were super close all of a sudden? Then there was a vision of Miles Morales murdering Steve Rogers, Captain America, which ultimately proved to not be true. (Until a future vision shows the event happening anyway, implying Miles might still kill Captain America, only in a later series). Ulysses, the future-seeing Inhuman who sets off the series, also “dies” in a way, choosing to abandon human form to become a Marvel god. Finally, there is Tony Stark who was only sort-of killed by Captain Marvel in a fantastic fight sequence that happened for no reason at all. Seriously, the two met because Miles, for some weird reason, dramatically asked Captain America to meet him in the exact spot where the future vision showed Miles holding Rogers’s body. Why they met there is beyond reason, especially knowing that Iron Man and Captain Marvel had become increasingly paranoid over the series. So Stark and Danvers went to stop Miles, who only wanted to talk or something, and Iron Man and Captain Marvel began fighting, because of course they would. Then she kind of killed Tony by blasting at him a bunch of times with lasers, but only to the point where he would slip into a coma. But it’s okay, because Stark probably wouldn’t have blamed Danvers anyways, according to Beast who can read comatose minds all of a sudden. And luckily the coma Tony Stark is in isn’t even permanent because he’s been experimenting on himself for years to, uh, not die? 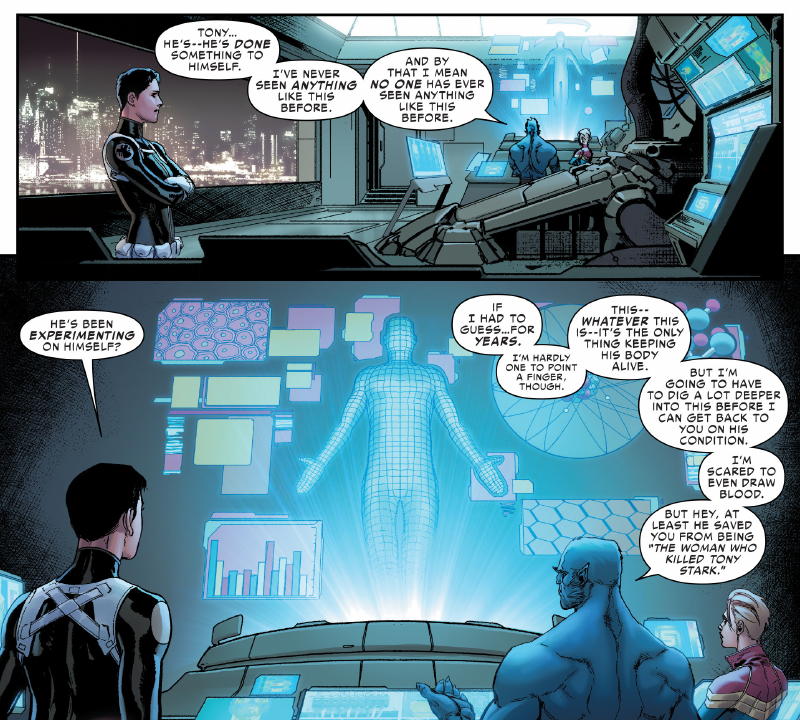 It’s not very clear exactly what’s up with Stark at this point, so Danvers and Beast just put him away while Stark’s mind acts as Riri Williams’ AI partner, and his body just exists in a hospital bed. This hectic summary of events is honestly necessary, if only to make sense of the confusing series of events that made-up Civil War II’s dramatic moments. It might help explain why despite the deaths of so many characters, Civil War II readers reacted mostly with a shrug. Not only do readers know that Tony Stark will undoubtedly come back to life, but Civil War II ends with previews of future stories, including the return of Thor Odinson, the rise of Ultron (again), and plenty of other stories, turning the whole event into a tease for even more events in the future. Marvel ends its 2016 event by buying into the cheapness of death that is so prevalent in comic books - choosing to use their Civil War II finale as an ad for future Marvel books, rather than following through with the first issue’s lofty narrative goals. And at the end of the day, important characters like Captain Marvel, Miles Morales, Steve Rogers, Jennifer Walters, and Tony Stark are left unrecognizable from how they began, and not in a good way.